It's hard not to admire Dr. Danny Jazarevic, who although an M.D., has spent much of his career since the mid-1980s in the Army, the National Guard, or the Army Reserve. Through the John McCain campaign, the good doctor issued a statement about Barack Obama's cancellation of his scheduled visit to Landstuhl Military Hospital in Germany. By the way, this is my second post in a row about a recipient of the Bronze Star. Dr. Danny Jazarevic served as the Chief of Trauma, Critical Care and Vascular Surgery at Landstuhl Regional Medical Center. In 1984, Dr. Jazarevic joined the United States Army and later the Florida National Guard. He has since served in Honduras, Africa, Saudi Arabia, Bosnia, and Iraq. From December 2002 through January 2006, Dr. Jazarevic was assigned to the U.S. Army Hospital in Landstuhl, Germany, where he served as Chief of Trauma, Critical Care and Vascular Surgery. During this period, he deployed to Iraq numerous times, including with the 101st Airborne Division Forward Surgical Team and as Director of Operations for the 44th U.S. Army Medical Command. He is currently the Chief Trauma Surgeon at a civilian medical center in Florida, and also serves as a full Colonel in the U.S. Army Reserve. Dr. Jazarevic has been awarded the Bronze Star Medal. In 1952, Bernard Malamud's The Natural was published. The book tells the story of Roy Hobbs, a fantastically gifted baseball player who is shot, to use Hobbs' words, by a "batty dame" just as his professional career is set to begin. At age 37, Hobbs finally makes it to the big leagues, and that's where I end my summary of the book. In 1984, Robert Redford, in a brilliant performance, portrayed Hobbs in the film version --which kicked off the baseball movie craze. Where did Malamud get his inspiration for his novel? In Chicago, more specifically, from something that happened at the Edgewater Beach Hotel on the city's North Side. 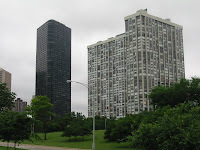 The hotel was closed in 1967--two condominiums, pictured above, stand on the site of the famous inn. Eddie Waitkus was a Rookie of the Year first baseman for the Chicago Cubs in 1946, and a two time all-star. While playing for the North Siders, Waitkus got the attention of an obsessed fan, Ruth Ann Steinhagen, who became depressed after Waitkus was traded to the Philadelphia Phillies. On June 14, 1949, the Phillies were in town for a series against the Cubs. The Edgewater was where visiting teams usually stayed, and Steinhagen booked a room there, invited Waitkus to her room, and shot him. She coldly told Waitkus, "If I can’t have you, nobody else can." Steinhagen was committed to a mental institution after the shooting. Waitkus almost died from his wound, but the following season, he played in of the Phils' 154 games--and the Phillies made it to the World Series for the first time in 35 years. Here are Waitkus' career stats. Waitkus served in World War II, survived some bloody fighting in the Philippines, and was awarded four Bronze Stars. Waitkus may not have been the real "Natural," but he was certainly a real hero. He died of cancer in 1973. Doug Ross has put together comic book version of a part of Barack Obama's life his campaign doesn't want you to know about: Buildings without heat co-owned by his financier and pal Antoin "Tony" Rezko. And State Senator Obama didn't know anything about it. Check out the chilling story--in storyboard format of course--here. Vote for Obama if that's the kind of change you can believe in. I linked to this post once before, but it's so good, it deserves a reprise. And finally, there are rumors that Obama will make an appearance at the Lollapalooza festival in Chicago's Grant Park this weekend. He'll be one mile from the Metropolitan Correctional Center, where the recently convicted Rezko resides these days. Will Obama drop by for a visit? "Today's GDP data are a stark reminder of the importance of focusing on the conditions facing American workers and the policies that will get our economy back on track. While growth continues to be disappointing, trade provides one of the few bright spots in an otherwise gloomy economic picture, raising questions about Barack Obama's policy of economic isolationism. "The data announced today show that exports grew 9.2%. Absent strong growth in trade, the economy would have turned negative in the second quarter, contracting by 0.52% instead of growing 1.9%. Senator Obama will throw up trade barriers that would seriously hurt American workers, businesses and our economy. When 95% of the world's consumers live outside our borders, it is crucial that we do everything we can to expand markets for American goods and level the playing field for American businesses and workers. "There is much that needs to be done to get the economy on track. John McCain's Jobs for America Plan will encourage new sources of energy, provide relief for skyrocketing gas prices, help families facing foreclosure stay in their homes, put a stop to Washington's out-of-control spending, keep taxes low to create good jobs here in America, and give American workers renewed confidence in their economic future."